It was leadership and management legend, Peter Drucker, who said that, "the only way to predict the future is to create it." Indeed, it is when we step into that creative process of truly 'participating' in the way the future unfolds, that we step into leadership. Whether you are inspired to grow and develop as a leader on your service path or in your personal life, coaching is a powerful way to engage your core values and longings, deepen your learning, and live more powerfully, authentically, and effectively into what you are seeking to embody and contribute. When you choose to work with me, you are choosing to plant and nurture the seeds of possibility you are already carrying with you. This requires an investment on your part - of resources like time, energy, and money - that you are making in your purpose, your business, and your relationships. But in the bigger picture, the benefits of coaching extend far beyond that scope - concentric rings of influence that travel out to your greater community and arguably out to the generations yet to come. A life and leadership practice that sources from a strong connection to your heart and inner truth, your nature as a community being, and your connection with the earth. One important aspect that sets my work apart from that of others is my nature-sourced, systems approach. What that means for our coaching relationship is that our work engages your wholeness not just as a leader, but also as an integrated, connected being. Coaching then becomes a process of opening up and "coming home" - the home that is your self, your purpose, your inner landscape, and your connection with all that you are a part of - and in so doing, allowing your life and leadership to grow from that fertile awareness. Rather than "fixing" things or struggling to force anything into being, your learning deepens, and you discover natural pathways and new skill sets to bring your gifts and passions more authentically and easefully into your life and service path. LEADERSHIP BEST PRACTICES - Developing key habits, routines, and skills helps the leader engage the world with purpose and effectiveness. Whether the focus is your career or personal life, our work may address areas such as communication, getting things done, effective use of time, managing/leading people, the practice of integrity, as well as conflict resolution and peace making. 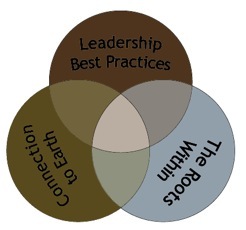 THE ROOTS WITHIN - It is the landscape within that gives rise to the way the leadership shows up in the world. Through inquiry and reflection, our work will provide insights into your inner ecology - your "root system" - that landscape of emotions, beliefs, and thought patterns that influences who you are BEING as you engage your life, your people, and your projects. CONNECTION TO EARTH - Albert Einstein said: "Look deep into nature, and then you will understand everything better." In that way, the patterns found in the natural world provide valuable insights for our own life and work in the world. Indeed, it may be those who personally cultivate a strong connection with the earth, who will be most able to usher in a new era of healing and regeneration in the world. "Christopher supported me in a powerful transition into a new professional role. He skillfully coached me into the confidence and clarity that I needed in order to gracefully walk into this significant change. I don't believe I could have arrived at this point of readiness without Christopher's wise accompaniment." Christopher led me through a guided, beautiful, intuitive process of self-discovery that laid the groundwork for positive change in literally every area of my life. I owe my reconnection to writing, my blog, my current career trajectory and a renewed sense of self to our work together. Every person and situation is unique, so I offer a number of customizable ways to work together. I recommend looking these over, then applying for a complimentary consult so we can decide together what kind of coaching engagement is the best fit for you. This is my most comprehensive, powerful, tried-and-true coaching offering, in which I guide you through a deep-dive transformative journey through the interwoven areas of your life and leadership - inside and out - so that you can shine your gifts more brightly in the world. Eleven 75-minute coaching sessions over the course of about 6 months (approx. 2 sessions per month). Sessions can be arranged to be in person (Richmond, CA) or over Skype, Zoom, or FaceTime. "Identifying, actualizing and then embracing a true calling is powerful work. I would not have been able to go to the deeper core-levels without Christopher's support, and the brilliant, unique framework that he has created. I am so deeply grateful and blessed for the whole experience and look forward, each day, to my unfolding vision coming to life." This offering provides focused support to break through stuckness and tension you may be experiencing on the precipice of something big. But for whatever reasons, you have been stagnating, not being able to take the leap into the unknown on your own. Whether it is a shift in your personal life (with regard to your your relationship, family or your habits), or your professional life (changing jobs/careers, embarking on a new direction or project, etc. ), this offering provides strong, catalytic support for those wanting rapid results, and are willing to go deep, fast. I can design custom coaching packages for you, your team, or your organization. Please click "Let's Talk" below, and apply for a complimentary consult to discuss your needs. The first step to determine if we have a good fit for working together, and to establish which kind of support is the best for you is to apply for a free consult, below. I look forward to hearing from you!